An amazing surprise in St Petersburg for sure! The staff is incredible, when I arrived one of them took me for a 15 minutes hostel tour explaining everything. Extremely clean! The "queen-size" bunk beds and the giant lockers under them are something I've never seen in any other hostel. Top notch! Best hostel i ever stayed. No words. They’re brilliant! Best place to be in Saint Petersburg :) Also a good choice if you prefer to stay in your own room, you already have the cost benefits in the the heart of the city and keep the great atmosphere of them! I highly recommend. 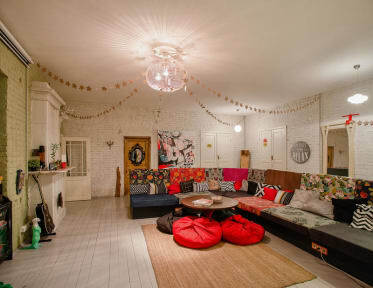 Um dos melhores hostel que já fiquei! Super organizado, limpo, o banheiro extremamente limpo e bom! parece uma pousada, pois é super estruturado!Os funcionários super atenciosos! A localização perfeito perto dos pontos turísticos, fazendo tudo andando! Super recomendo!!! Muito obrigada!